Many consider the term as one of endearment—a sign of our good nature toward others and comfort in our neighborhoods. To others, however, it may ultimately lead to ignoring discussions about hard topics like racism. A group of local writers sees that and wants to get people to talk. To embrace the uncomfortable. 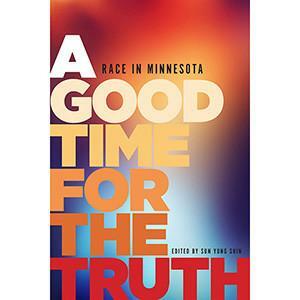 They hope their stories help to get the ball rolling in a compilation of essays called A Good Time for the Truth: Race in Minnesota, edited by Sun Yung Shin. The writers featured in the book come from all different backgrounds, with one thing in common—they are all people of color. They have all also been discriminated against in some way, shape, or form during their lives in Minnesota. The writers do a brilliant job of making the readers think, laugh, cry, get angry, and become hopeful—sometimes all on one page. Shin begins the book with an introduction that’s wonderfully written, and at times incredibly real. She states that, while none of the writers featured serve as spokespeople for their specific race, gender, or any part of their identity, everyone’s story is still valid. Shin also offers a raw but important preview to the stories ahead in the rest of Truth. Niceness is not fairness. Peace (or the absence of open conflict) is not justice. Comfort is not guaranteed. Until we dismantle this system, we will insist, in words and actions: Change is necessary. We offer this book to speed that change. All 16 of the featured writers provide the first steps in their essays to help make that change happen. Many of the works provide eerily relevant pictures of what life is like for people of color of all kinds in Minnesota. In the first essay, Shannon Gibney writes about the “Fear of a Black Mother,” which, for her, starts earlier than many might think. She describes a trip to a mainly-white South Minneapolis co-op gone wrong when her (adorable sounding) two-year-old son gets into a display full of pie, and she can feel the employees judging her and her husband, who is also black. They then have an important discussion about how some people will immediately fear their child, even though he’s not even in school yet, just because of the color of his skin. These depictions of life as a black mother are raw but real. There are stereotypes aplenty about how certain people are treated in certain parts of the United States; to my surprise, many of those stereotypes are squashed in Truth’s writings. An example of this is in the second essay featured, “Disparate Impacts,” by Taiyon J. Coleman. The Chicago native is pursuing a master’s degree in creative writing and is stuck between the University of Alabama and the University of Minnesota. Coleman says she doesn’t need to visit Minnesota because it’s far enough north and it’s the home of her “main man” Prince, so it can’t be that racist, right? Coleman’s descriptions of life in both institutions left me speechless. She paints a disturbing but important picture of what it was like as a person of color in a predominately white institution that hit too close to home for me—in the best way. I cannot discuss racism without the intersection of my transgender status. Many of the writers bring up two other important points—internalized racism, and what’s called “code switching.” Besides being the name of an amazing NPR podcast, to code switch means to change the way you talk, act, and live in certain parts of society—mainly, to “act white.” Carolyn Holbrook discusses when a potential employee told her to do just that as part of a voice exercise in “Say What?,” which leaves her speechless and angry. Others talk about learning their internalized racism while growing up—Bao Phi (“Brutal”) and JaeRan Kim (“The Good Kind of Immigrants”) both mention this and how sickened they are by it now. Many readers of color might feel the same way, myself included. But this book gives me hope. Overall, I believe that everyone should read A Good Time for the Truth. Each of the stories provides a modern and relevant look at life in Minnesota from the eyes of people who live it every day. It will be hard and uncomfortable for many, but that’s the point. All of the writers hope that readers feel uncomfortable but ready to change the world we live in. Thank you so much for covering our anthology!